Parents who want to get their children educational toys are spoilt for choice. These toys keep improving in sophistication and function so much so that parents have difficulty keeping up with the latest technology. But the kids take to these electronic toys like duck to water. 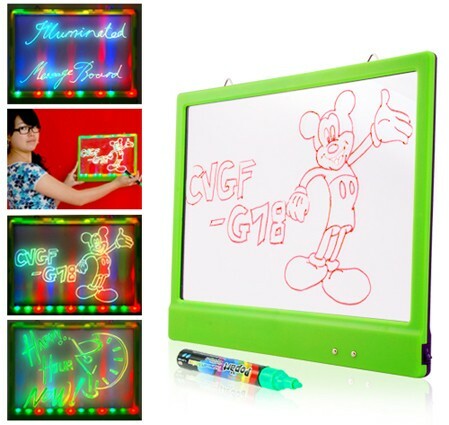 The traditional sketching board like Lite-Brite and Etch a Sketch may have helped to turn out a whole generation of children who can read and write but make way now for the LED Illuminated Message Board. The LED board not only has magic pens and the easy erase function but flip a switch and everything will be lit up like a neon sign. The multi-color illuminated LED message board does not only stimulate the imagination of children and fill their palate with colors; it can also be used by adults to leave important messages on the fridge or the shop window. Both children and adults are fascinated by colorful lights and this is a gadget that can appeal to all in the family.